Have you taken part in the School for Change Agents? Or are you passionate about making change happen in health and care? As part of the work we've been doing with our Alumni, we'd like to invite you to join us for an online session via Zoom on Friday 3rd August from 1pm until 2.30pm to co-produce the re-write of our White Paper: The new era of thinking and practice in change and transformation: A call to action for leaders of health and care to capture your examples of great practice in sustained change which illustrate your learning and inspiration from the School’s key principles. It has been the key source document for the School of Change Agents and summarises the key themes from School. It was the most downloaded white paper in NHS history which is not surprising as it really spoke to people in health driving improvement. It was optimistic, forward thinking and inspiring. It was a document ahead of its time and pre-dated important and evolving trends such as new power, leading from the edge, the importance of finding connections in an increasing global and digital world and the importance of story and narrative. 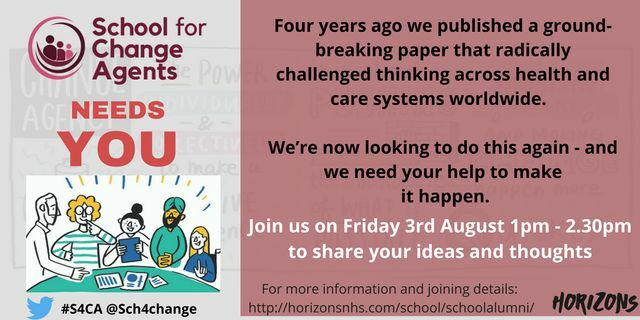 An updated of New Era is needed however to reflect the rapidly evolving thinking about sustainable and important change driven by engaging and inspiring those working in health and social care.While the School for Change Agents drew heavily from New Era, it has evolved passed the paper over time and increasingly draws upon new thinking and new research. We would like to know your ideas about what should be included. The original paper, for example, talks about five enablers and 15 actions. We would like your thoughts about these and whether these are meaningful for you. Do you think anything is missing? What new research or practice should we include? We also want to capture examples of great practice in sustained change you are involved that illustrates the key principles of School and the next version New Era paper as we want to include some great examples from those who were inspired by School.